When it comes to selecting pressure measuring instrumentation, there are other criteria to consider besides pressure range, type of connections, and output signal. Choosing between measuring absolute pressure and measuring gauge pressure may have an impact on the quality and accuracy of your process. Pressure is usually measured by quantifying the deformation of a sensing element where one side of the sensing element is in contact with the process media and the other side is exposed to a reference pressure. If the reference pressure is ambient pressure, the measurement is called gauge pressure. If the internal side of the sensor is subjected to a vacuum, the measured value is called absolute pressure. Gauge pressure is zeroed against ambient air pressure while absolute pressure is zero-referenced against a vacuum. As a consequence, absolute pressure is equal to the gauge pressure plus the atmospheric pressure. If the pressure you want to measure or control is not affected by changes in atmospheric pressure, as when measuring hydraulic pressure, pneumatic pressure, or the level of liquid in an open tank, then you need to use a sensor that measures gauge pressure. If you want to measure pressure that is affected by atmospheric pressure — in closed systems or sealed containers, when assessing altitude in aeronautic applications, or when you need to measure the atmospheric pressure, itself, for example — you require an absolute pressure gauge. Absolute pressure gauges are typically used in research and scientific laboratories where fluctuating atmospheric pressure can become an issue and in aeronautics where precise measurements are critical to determine altitude. The food packaging industry makes extensive use of absolute pressure gauges to assess vacuum independently from atmospheric pressure. This is a critical application as only very good vacuum packaging can ensure food quality over a certain period of time. Using a dependable, accurate absolute pressure gauge that fits the conditions imposed by your application will ensure proper measurements and the integrity of your process. 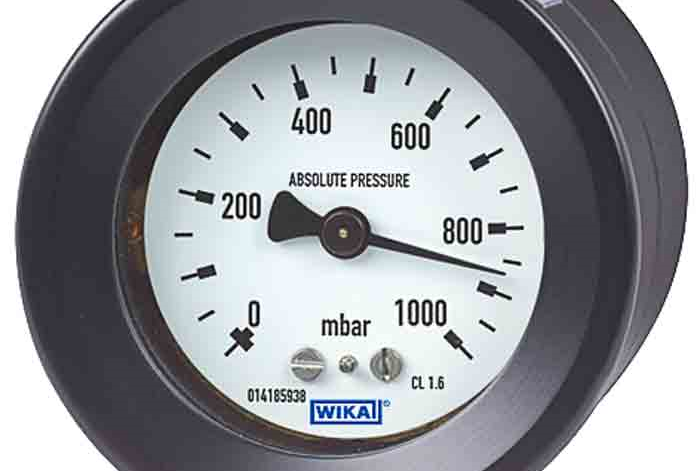 WIKA’s 516 series of absolute pressure gauges is suitable for clean and dry gaseous media that does not attack copper alloys and aluminum. The stainless steel 532 series of absolute pressure gauges is more appropriate for gaseous and liquid aggressive media. Call WIKA’s experts today. They can help you determine the pressure gauge that is most appropriate for your needs.